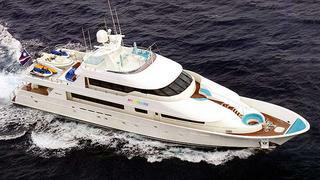 News from Michael Mahan at Worth Avenue Yachts that he's just closed on the sale of Westport's 39.62m motor yacht My Colors with the seller represented by Frank Grzeszczak senior and junior at International Yacht Collection. Built in 2005, this tri-deck offers exceptional luxury, convenience and privacy with elegant lines and a spirited performance. High quality materials, components and technology ensure exceptional reliability and uninterrupted enjoyment. The stabilised hull of My Colors delivers a 20 knot+ cruise speed and a 3,450 nautical mile range at 12 knots. The skylounge has access to the boat deck that has casual dining for eight to 10 guests, an eight-person Jacuzzi and stairs leading to the flybridge and aft deck. With accommodation for 10 guests in five staterooms and a successful charter history, My Colors was asking $9,450,000 and will be renamed Trisara.